19/11/2012: CyanogenMOD launch their 'Apollo' music player, Nexus 4 drop test, 'Modest' Windows 8 sales and much more! CyanogenMod launches their 'Apollo' music player on the Play Store! CyanogenMod is undoubtedly the most popular custom ROM in the Android world and recently they've been looking to slightly expand their horizons. The devs over there have been looking into ways to make not just the firmware better but also the apps you use on a daily basis. One of the first targets was the music player which undoubtedly is one of the less attractive parts of Android. So today we present you with the fruits of the guys labour! A new, more attractive, holo-themed music player. At the moment you have two options; the first of which is the buy the app for £0.62 or $0.99. This will get you Apollo+ and it has the added bonus of faster updates and it will rid you of ads, both privileges will be missing in the free version! You can get Apollo+ here or standard Apollo here. And yes they do both work with un-rooted devices! So how does that glass-clad Nexus 4 hold up when it's dropped? That question is something we're sure you've been asking yourself ladies and gentlemen. After all when LG and Google announced the device we ourselves were sceptical about the devices resilience to accidental drops and bumps, especially since Apple's iPhone 4 and 4S' had a reputation for getting cracked backs! The lovely demo above, in German unfortunately, has all the clunks and damage on it, so watch that bit before you carry on, otherwise we'll spoil the results for you! Surprising, the Nexus faired rather well in the tests. When dropped from waist height, probably the most likely height for the device to be dropped from, there was very little damage only a couple of scuffs around the edges. Although, had the phone landed flat on either side we think there could have been a nasty smash. From head height though your shiny new Nexus probably won't survive. The one in the video landed towards the top of the phone on its back and even Corning's Gorilla Glass 2 wasn't enough to save it! Just like it's iPhone predecessor though the phone still worked absolutely fine despite the impacts and assuming you look after them well and take a little bit more caution with it, or perhaps even put it in a case, the phone will be absolutely fine! It's the 5th birthday of Amazon's Kindle eReaders! Apparently Microsoft's sales of Windows 8 have been 'modest' since the software's launch. Microsoft puts it down to OEMs and their "inability to deliver" more inspiring hardware with better availability. Although, perhaps it isn't fair to blame OEM's for the slow start because Windows 7 is an excellent operating system with very few flaws, when it launched it replaced Vista, an operating system with very little love, so perhaps it will take a while for people to see the merits of Windows 8. 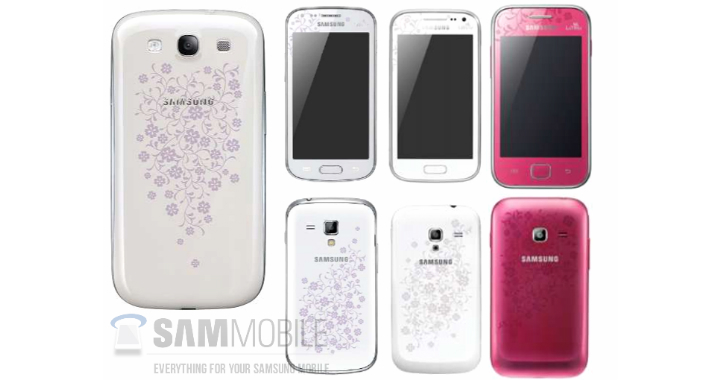 The guys over at Sammobile have got hold of a render which shows special Valentine's day themed to their Galaxy S3, Galaxy Ace 2, Galaxy Ace DUOS and Galaxy S DUOS! How do they look to you? Google has reached a licensing deal with Armonia, who are a music licensing initiative that represents an alliance of publishers from across Europe. The agreement will boost the Play stores content by about 5.5 million songs, just in case 3.5million wasn't enough already! The unique thing about this deal is that Google has got a license for 30 countries in one go! Normally companies have to negotiate on a single country basis so this makes it a lot easier for Google! Huawei may be the next phone manufacturer to release colourful Windows Phones if leaked pictures of their Ascend W1 are anything to go by! "I've been privileged to lead one of the world's greatest companies. After almost four decades with the company and eight years as CEO, it's time to move on and transfer Intel's helm to a new generation of leadership. I look forward to working with Andy, the board and the management team during the six-month transition period, and to being available as an advisor to management after retiring as CEO." It's been confirmed that there is indeed a bug in Android 4.2's calender which means that December does not currently exist. Hopefully Google will be working on a patch as we speak, but that didn't stop HTC UK tweeting that they aren't releasing Jelly Bean at the moment because of this bug. Strangely though that tweet has since disappeared so we've only got Modaco's, Paul O'Brian, and his retweet of their post to show you. Phones4U appear to have found to details about the Windows Phone 7.8 update! You can find the full details here. Some of you may remember that at the tail end of last year LG and Box.net signed an agreement that enables all LG smartphone customers to get 50GB's of storage on Box's servers. It turns out that the Nexus 4 also gets the same privilege because it is an LG phone after all! That's an added bonus for you guys out there who've managed to get your hands on one already! And finally, the UK has a new MNVO today after 'The People's Operator' launched today. The network itself piggy backs on EE's network and the main selling point of this new enterprise is that they give 25% of their profits to charity. You can find more information about the company, including their price plans, which are not as cheap as most networks at the moment, can be found here. Although, our take on this is that we would buy a phone contract and then donate money to the charity of our choice via direct debit instead, but each to their own, this way you halve the direct debits!